Subscribe to Country Style magazine for 12 or 24 months and receive Free Sale & Pepper Mills! Modern and contemporary, these salt and pepper mills made of brushed stainless steel combine function with flair, adding that special touch to the table and kitchen alike. 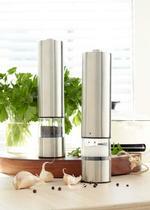 Simply press the button on top to dispense freshly ground salt and pepper. Offer expires 02.05.2019 or while stocks last. Free Gift applies to 12 or 24 month subscriptions only. Available to AUS residents only. Gift is sent to the purchaser. If you’re inspired by the diversity and simplicity of the Australian country, you’ll love delving into this mag. With every issue you’ll travel to new and different country locations to meet fascinating people living on the land – discover the food and wine they produce, and the art and craft they create. You’ll step inside stunning and historical country homes and find inspiration from the renovation stories, clever designs and decorating ideas – from structural changes to fabrics and furnishings. Country Style celebrates the diversity of modern Australian living – from the country to the coast. Combining quality journalism and stunning photography, Country Style brings to life the stories of inspirational people and places from around Australia. It visits amazing homes and gardens, travels through Australia’s most vibrant regional centres and samples all the good things the country has to offer. Plus, each issue is packed with stylish home decorating ideas. Absolutely love Country Style - the whole vibe of the magazine makes Australia look jst so fantastic. I love the Heirloom recipes and the dog tales in particular! Love this magazine - particularly enjoy the inspiring stories on those who have left the city and started a new life in a regional area. I&apos;m half way there, just need to find the new home. I love this magazine. Having grown up in a country town and now living in Sydney, the magazine takes me back to the country. I absolutely love Country Style and look forward to each months edition. Everytime I recieve my copy of Country Style magazine it has amazing stories, stunning photographs and delicious recipes. I am never disappointed. I await with anticipation the hand-me-down of this magazine from my Mum each month - Having grown up in the country, this magazine always makes me feel as though I have gone back home. I especially love the articles regarding artists living in the country - a dream lifestyle! This is a truly beautiful magazine. What a wonderful country we live in! Country Style is a great magazine. It has lots of informative and beautifully presented articles that are accompanied by beautiful photography.It is my favourite Australian magazine! You don&apos;t have to live in the actual country to enjoy all that this mag has to offer. The rustic styling can be copied and enjoyed anywhere. Be inspired by the innovative ways rural Australians are making happy and successful lives on the land. Beautiful gardens, fabulous food and romantic homestead havens are swoon worthy and I always look forward to my next issue of Australian Country Style. I wait impatiently for my new edition to arrive in the letter box and have used many of the ideas in our new home. I love this magazine but have noticed some nasty terminology creeping into the articles yesterday. We do NOT have country &apos;villages&apos; - they are towns, & we have large properties or &apos;stations&apos; not &apos;holdings&apos; etc etc. It&apos;s our country style not another country&apos;s.
I have been buying Australian Country Style since 1994 and I am never disappointed by the various topics that are covered. I would dearly love to own a little country cottage and challenge myself to see how well I could decorate it. Country Style is the one mag that I never want to pass on as I keep going back to reread so many of the stories. So Country Style, I will keep on with my subscription as I feel it keeps us city slickers in touch with the real Australia. I love this magazine! Though I will probably never own my own country cottage, I revel in reading about the amazing ways that others have brought their dreams to life. Beautifully photographed, every issue is a trip into fantasy land for me. I just love this magazine and cant wait for the next issue to come out each month. For a country girl living in a city - it is a must READ! It is my way of feeling close to the land and the people who live and work there. I saw an article in the Australian Country Style magazine in early 2002 on a farm (I think it was located in NSW) that had converted a working shearing shed into a reception for wedding&apos;s. It also used the homestead as accommodation and had built a chapel for ceremonies on the property. From memory all the buildings were made of stone, I think blue stone. This is published 13 times per year, please allow up to 4-7 weeks for your first delivery. Your subscription will begin with the next available issue.